Students of recent Cuban economic history will be familiar with the crisis the country underwent after the collapse of the Soviet Union and of the system of economic relationships between socialist countries known as COMECON (Canler, 2001). Almost overnight, Cuba lost the international economic relationships that underpinned its domestic economy. Among the resulting painful consequences was the steep depreciation of the Cuban peso (CP) versus the dollar and its loss of purchasing power in the domestic market. The government found it prudent in 1993 to legalize the U.S. dollar for domestic transactions. Three currencies were suddenly legal tender in the country: the U.S. dollar, the depreciated Cuban peso, and a “convertible” peso (CUC) that could be exchanged for one U.S. dollar. Subsequent fiscal prudence by central bank authorities allowed the Cuban peso to appreciate from over 100 to the dollar to around 20, but it has never appreciated further. Moreover, the exchange rate between the “convertible” peso and the Cuban peso, and thus between the peso and the dollar, was only for the purposes of personal transactions. For commercial transactions between enterprises, transactions between government and enterprises, and in foreign trade, the Cuban peso was deemed to be at par with the U.S. dollar, until 2006. In 2003 a new wave of monetary reform started, geared toward centralizing foreign exchange transactions via the central bank, taking the U.S. dollar out of circulation, and fixing the rate between the Cuban peso and the CUC at 25 to 1 (González-Corzo, 2007). In 2006, the exchange rate between the CP and CUC was modified to CUC$1.08 per CP. In other words, the “convertible” peso and Cuban peso were both appreciated against the dollar. The current status is that US$1.08 will fetch one CUC, and 25 CP will fetch one CUC. The implied rate between the dollar and the CP is CP=US$0.0432. The large gulf in exchange rates between 1.08 and 0.0432 should suggest a giant misallocation of resources at the national level that pinches on the economy’s growth potential. However, the specific purposes of this paper will focus on three other themes: (1) to show that the economic unit that bears the brunt of the dual exchange rate system is the household; (2) to show that the consequent powerfully perverse incentives that are created will greatly limit the salutary effects that future economic reforms might have; and (3) to suggest a mechanism for unifying the exchange rate that may be painful to some, but which will probably improve equity in the society and allow the benefits of other reforms be fully gleaned. For the stated purposes of the paper, it is a useful simplification to assume that the CUC does not exist, and as long as it remains fixed to the dollar, the results are identical regardless of whether the CUC or the CP is analyzed. So the exchange rate of the peso (CP) is framed in what could be called a classical approach, whereby the price of the dollar in pesos is determined by the intersection of a demand and a supply curve for dollars. The Cuban market for U.S. dollars can be depicted as in Figure 1. There is a typical negatively sloped demand for dollars in terms of pesos (D). The supply of dollars (S1), however, is discontinuous in Cuba. The government makes available at a price p0 (CP0.926=US$1.00 or, conversely, US$1.08=CP1.00) a limited amount of dollars (q0) to official importers. Beyond that quantity there may be further sales by the government at CP23.15=US$1.00 levels plus additional sales at the same price by households receiving family remittances from abroad and/or have other sources of dollar income. (For simplicity, exchange fees, which in Cuba are different for exchanging U.S. dollar versus other currencies, are not considered.) Ostensibly the government will sell any amount of dollars (in actual practice, CUC) at 23.15 to 1. The relative sizes of the market for non-personal transactions (q0) and the socalled “free” market (q1—q0) is not public knowledge. Under this schematic the “free” market is at equilibrium at d, with price p1, currently established at 23.15. If the imposition of the CP0.926=:US$1.00 (p0) exchange were eliminated from official dollar earners, it is reasonable to suppose that its supply curve would assume a more typical continuous positive slope, as in S2. The logic is that if dollar holders could make more than 0.925 CP on the first dollar sold or exchanged, they should be willing to earn less than today’s “free” market rate on the last dollar earned. In this scenario the equilibrium exchange rate would be at c, with price p2 and quantity q2. The slope of this continuous supply curve is unknown, especially at points beyond q1, but it is reasonable to assume that in a free market the exchange rate p2 would be lower than today’s “free” exchange rate at p1. It would also be closer to a true exchange rate in that economic agents are free to transact as they choose. Thus, p1 will henceforth be described as “free” only in quotation marks to signify that it is free in name more than in deed. In this schematic, the area circumscribed by the triangle P0ab represents a loss in producer surplus, i.e., a loss to foreign exchange earners forced to exchange at CP0.926=US$1.00 (p0). The area circumscribed by the polygon p1dcp2 represents a loss in consumer surplus, i.e., by buyers of the “free” exchange rate. This loss is mitigated by government transfers to consumers from the garnishments in P0ab. The area circumscribed by the triangle ecb represents a deadweight loss, i.e., losses from which neither consumers nor producers benefit. This analysis also suggests that the common practice of translating Cuban salaries into dollars using the “free” exchange rate is as misleading as using the official exchange rate for non-personal transactions. The economic reality is that a salary of CP400 is worth less than the US$432 suggested by the official exchange rate, but also more than the US$17.28 suggested by the CUC exchange rate. The difference in exchange rates between the current system and what would prevail under a free market (p1—p2) implies that there are winners and losers, as the market is distorted away from a free equilibrium. The winners are those who can buy at the preferential rate p0 (below the free equilibrium price) and those who can sell at p1 (above the free equilibrium price). The losers are their counterparties, i.e., those who have to sell at p0 and buy at p1 when they could be selling higher or buying lower (at p2). The Cuban government, with few exceptions, owns the country’s productive infrastructure. Thus the delineation of buyers and sellers is less distinct in Cuba than in other economies, and so is the distinction between losers and winners. However, in this framework it helps to differentiate between government enterprises and the government itself, the latter being the institution that legislates and executes laws. Whereas one can assume there will always be a government, the incidence of government in enterprise can be variable, and has been variable in Cuba over time. For example, many formerly 100% government-owned enterprises are now joint ventures with foreign partners. In agriculture there are also private farmers and the cooperative production units, which are ostensibly no longer in the state sector and have at least an organizational distinctiveness from other state agricultural entities. Least fuzzy is the delineation of households, which remain distinct and apart from the government and which figure prominently among the winners and losers. The first group of winners is made up of those who are able purchase or procure dollars at p0. These include the importers of basic commodities, including food, medicine, and energy. By extension the consumers of these commodities also benefit. These will be the households that purchase food from the ration book (almost all of them), households that receive free healthcare (almost all of them), and households connected to the energy grid (almost all of them). The second group of winners is composed by those who sell foreign exchange at p1. These include government entities that may have some discretionary sales of dollars through exchange houses, and households that receive remittances from abroad or receive some dollar income. Other beneficiaries are local producers whose competitors have to buy at p1. These would include light industrial goods manufacturers such as footwear and some parts of non-export agriculture. A Cuban consumer can either go to the store where only CUC are accepted (called “shoppings”) and purchase food at the p1 exchange rate or go to the local farmers’ market. The “shopping” and the farmers’ market are competitors. Similarly, a Cuban shoe manufacturer might be able to sell part or all of its production at a store where the alternatives are shoes priced on the basis of a p1 exchange rate. The first groups of losers are those sectors which have to sell foreign exchange at p0. These include the state exporters such as the tourism sector, export agriculture, mining, and biotech. Foreign investors figure among the losers too. Their investment funds are valued at p0 and/or their local purchases are valued at p1. Thus the cost of their share ownership is high as well as the cost of local inputs. This probably acts as inhibitor to foreign direct investment, but this is a subject worthy of its own paper and is only mentioned here. Additional losers include the local producers whose competitors buy at p0. This group may include non-export agriculture, which may have to compete with some commodities produced in government units such as farms operated by the army with access to dollars at p0. It would stand to reason that private farmers (as opposed to the Basic Units of Agricultural Production, which may not have much latitude) would choose products or market timing so as not to compete head on with these state institutions, but the competition may not be altogether avoidable. Thus non-export agriculture stands to both win and lose from the double exchange rate, depending on what they produce and when they produce it. The domestic oil producer who may compete against imported oil priced at p0 also stands to lose. It is reported that Cuba’s oil production is almost entirely destined to the generation of electricity (Piñón Cervera, 2005). Thus the exchange system serves to penalize production of oil in favor of consumption, both in industry and households. It can be argued that the biggest losers, outside of the economy as a whole, are the households. Cubans overwhelmingly work for state enterprises that sell or price at p0. These entities will obviously have a derived factor demand function based on p0 as well. Moreover, government regulations, in the pursuit of equity, prohibit wages based on p1 or paid in foreign exchange, except for tips and some bonus packages. The households receiving these tips and bonuses (dollar income) are still a small minority of total households. Thus for most Cuban households every single purchase that they make of goods priced on the basis of a p1 exchange rate leads to a loss in welfare. The households’ situation can be represented as in Figure 2. 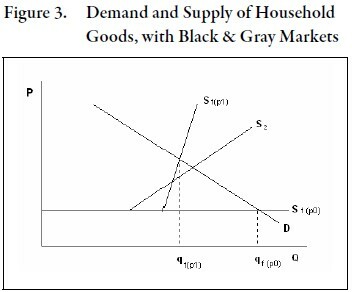 Households have demand D for household goods. Let us say, for the sake of argument, that at one time peso stores (those selling at p0) met all the demand, at qf(p0). However, as offerings at the peso stores have shrunk, the households have had to resort to the “shoppings,” farmers’ markets, and/or the black market, which are a function of p1. Thus the households face a kinked supply curve, with a new equilibrium at qf(p1). If the quantity of goods offered at the peso stores keeps shrinking then a new equilibrium may be at qf(p1’). Alternatively, if the offerings at peso stores stay the same, but the peso appreciates against the dollar as it did in 2006, then the slope of the supply past the kink becomes less vertical (as in the dashed portion), and there would be a higher equilibrium level of Q. This higher level of consumption for households was probably the rationale for the government’s decision to revalue the CP. But as can be seen by the shift from Sf(p1) to Sf(p1′), any reduction of offerings in the peso (CP) stores can easily neutralize any benefit of a revaluation. It is clear that any purchase based on a p1 exchange rate in a household whose income is based on p0 represents a loss in economic welfare. With p1 being over twenty times the value of p0, it is easy to surmise that the double exchange rate system represents a large welfare loss for the Cuban household with access only to CP. What can householders do about their shrinking fortunes? They can supply goods and services on the basis of a p1 exchange rate. This can be accomplished through legally registered self-employment or through the private production of goods, such as in private farming. Households can also provide black market goods and services. Since the state is basically the sole owner of all the means of production, the goods perforce have to be illicitly acquired from the state’s stock. 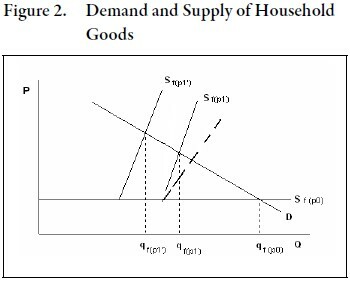 As more goods and services are offered at price levels above the government set ones, the effect is to flatten the supply curve at quantities beyond the kink in Figure 2. Also the “disappearance” of goods from state stocks has the effect of moving the kink to the left (reducing the availability of goods at government set prices). The net effect is that the householders’ efforts to subsist create a smoother, less kinked supply curve as S2 in Figure 3. The new equilibrium level may be at a lower price and larger quantity, but, as presented in the last section, if the kink caused by the disappearance of state goods shifts sufficiently to the left because of reduced offerings at the peso stores, the net gain may be close to nil. In either case, wildly perverse incentives are created. With the CUC set at nearly 25 times the value of the CP, and many essential goods and services available only in CUC, it behooves the householder to supply those CUC-earning goods and services regardless of their intrinsic value to the economy as a whole. Economic activity no longer is allocated according to its intrinsic value in the economy. Economic perversions occur such as “engineers operating restaurants, psychiatrists working as car rental agents, and doctors moonlighting in taxis” (Peters, 2002). These perverse incentives can attract resources away from sectors that could ostensibly lead to higher economic growth, e.g., education. Perhaps more importantly, they will also reduce the effectiveness of any future market opening measures. For example, if restrictions on agriculture were relaxed, and farmers were allowed more freedom to grow and sell whatever they wished at whatever prices they could fetch, the supply response would be reduced if tip money at a nearby tourism facility could still represent many times the average wage. If that option were not available, more labor would stay or return to the farm to produce the goods made more remunerative by the market reform measures. However, if the government liberalized the restrictions on self-employment, perhaps too many resources would be drawn to that sector because it would price at p1 and leave other important sectors such as healthcare and construction economically bereft. It is thus prudent, if not imperative, that exchange rate reform be a prerequisite to other market- opening measures. The double exchange rate system not only penalizes the householder, it can also vitiate the effectiveness of otherwise sensible reforms. 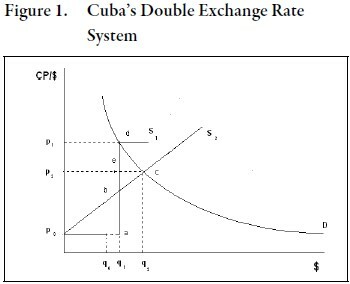 Cuba has four basic approaches available for its exchange rate regime: (1) do nothing, keeping dual exchange rates; (2) strive for a closer alignment between the CP and the CUC through careful monetary policy; (3) achieve unification through a sudden float; or (4) achieve unification at a new fixed rate. Government policymakers officially acknowledge the need to unify the currencies. Indeed eliminating the dollar as legal tender for domestic transactions was seen as an interim measure toward unification (EIU, 2006). The Cuban government has publicly opted for (2), keeping inflation in check and avoiding the rapid currency movements experienced in the 1990s. However, the differential between the CP and the CUC has hardly budged in ten years, effectively making (1) the unofficial government approach, with the prolonged detrimental effects on householders and the economy in general discussed above. Alternative (4) could be workable in theory, but the government probably lacks the credibility and reserves to establish an exchange rate that is both convertible and fixed. (Foreign reserves would be necessary to counteract any run on the currency and its new parity value.) However, alternative (3) can prove workable in practice, and finally rid the country of its dual exchange rates and the resultant household poverty and economic perversions. Since the CUC is largely an artifice of the economic crisis of the 1990s, and since wages and settlement of accounts still take place overwhelmingly in CP, it is proposed that the CUC be entirely eliminated from circulation. (Some might argue that the sordid history of the CP would make it the better candidate for elimination, but the choice of currency is not intrinsically important.) The government could announce that the CUC would cease to be legal tender on a given date, similar to the elimination of the national currencies when the Euro became the legal tender in many European countries. Holders of CUC would have a known number of days to exchange their notes for CP. The central bank of Cuba knows the amount of CUC in circulation. In preparation for the reform, it can print new CP notes at a fraction of the nominal value of CUC in circulation. The value of this fraction would depend on several factors, including the relative stock of bills currently in circulation of CP versus CUC and the desired range of final value that is desired for the CP relative to foreign currencies. The amount of new CP bills will depend on whether authorities want the CP to be close to parity in relation to, say, the Euro or if it desires a future exchange rate of, say, ten CP per Euro. The central bank can then divide the stock of new bills to be exchanged into lots of equal size and equal in number to the trading days before the CUC is no longer legal tender. The exchange houses can then bid for the day’s stock of CP with the CUC they have in hand. The central bank will auction off the day’s lot according to the highest bids received. The highest bid on the last day will determine the final value and thus the value of the CP relative to foreign currencies. For example, if the final value of the CP is CUC0.10 and the CUC was being exchanged at €0.70, then the new value of the Euro in relation to the CP would be 1/ (0.1)*(0.7)=14.29. As a way of maintaining the CP as a store of value, interest- bearing Euro accounts should be made available to households and legal entities. (The American economic sanctions program would make the dollar a difficult substitute.) By making possible a flight to the Euro by individuals and economic entities, the Cuban central bank would be motivated to keep the monetary base in check and to influence total money supply via differentials in interest rates between CP and Euro accounts. A flight to Euros could be staunched by a rise in interest rates in CP accounts, taking CP out of circulation. With prudent management over time, confidence in the CP would increase and interest differentials could decline. As with the current situation, this exchange rate reform would create winners and losers. The reform will have the effect of pushing p0 and p1 together. The losers will be all those individuals and entities that are holding CUC at the beginning of the reform who had originally exchanged foreign currency at the p1 exchange rate. Among the losers will also be those who are holding inventory in CUC. Losers will also be any entities that are able to exploit the differential between p0 and p1 that will cease to exist, such as government employment agencies that pay in CP but charge foreign entities in CUC. However, the winners will be the overwhelming majority of Cuban households which receive wages denominated in CP. At least equally as important, the overall Cuban economy will also be the winner, as it sheds the perverse incentives caused by the current system and add to the effectiveness of any future market-oriented reforms. Moving to a unified managed float is not a panacea. Difficulties, both technical and political, will arise. For example, mechanisms will have to be put in place to prevent possible manipulation by powerful players in the exchange market. Also, the losers will surely exert powerful political pressure to keep the status quo: mere lip service about moving toward a unified exchange rate. But the economic welfare of the vast majority of Cuban households and the sustainable future economic growth of the country are at stake. Cuba’s central bankers and politicians can ignore these factors only at their long-term peril.